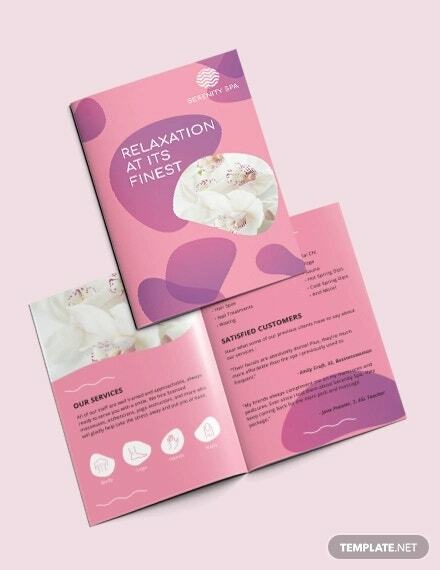 The Massage brochure templates are as calm and soothing as a spa. 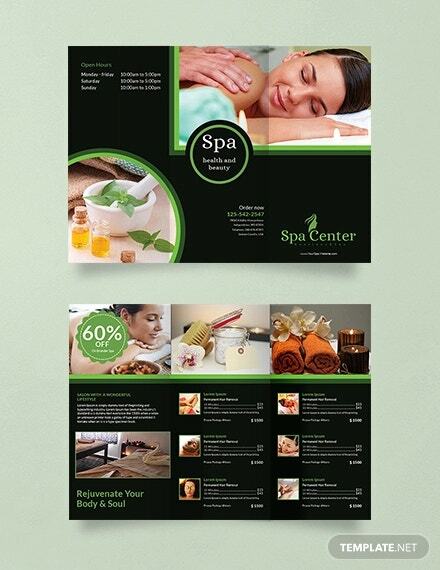 They are infographic handouts which can be used as flyers, publicity media, and front desk introductions. These are available in electronic formats that contain all that you need in the layout with full customizability in variable sizes and file types. 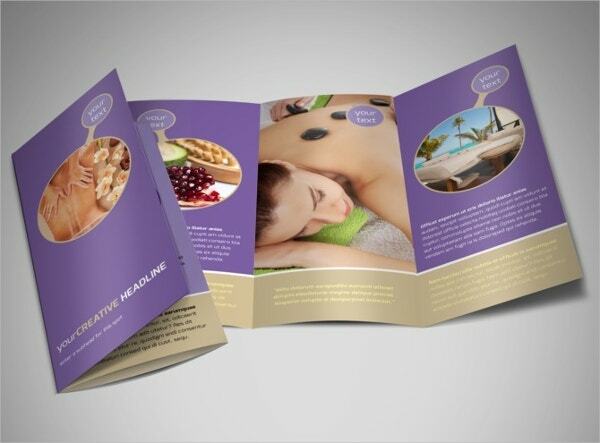 They include spa brochures, medical massage brochures and much more. 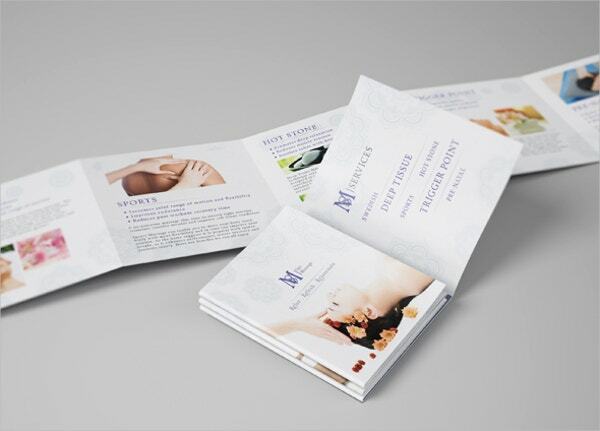 Download one today and boost your market outreach with these delightful massage Brochure Templates. 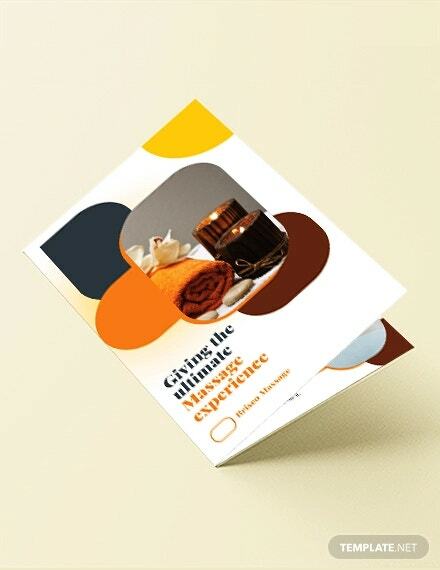 The brochure comes in three colors and minimal graphics. 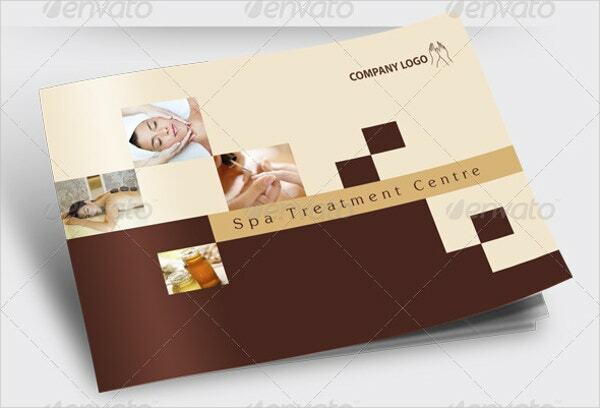 It has a trifold design which enhances the readability. Download this brochure in INDD files with 300 DPI prints in A4 size. 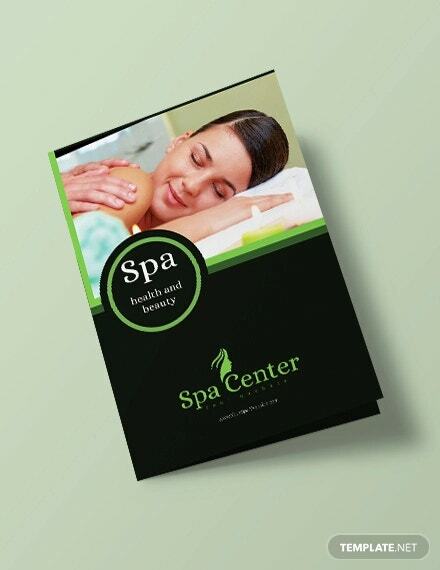 This Square Brochures has a soothing design with a spa themed photo on the cover. It has text and information options inside with 8×8” page size in JPG, OTF files. 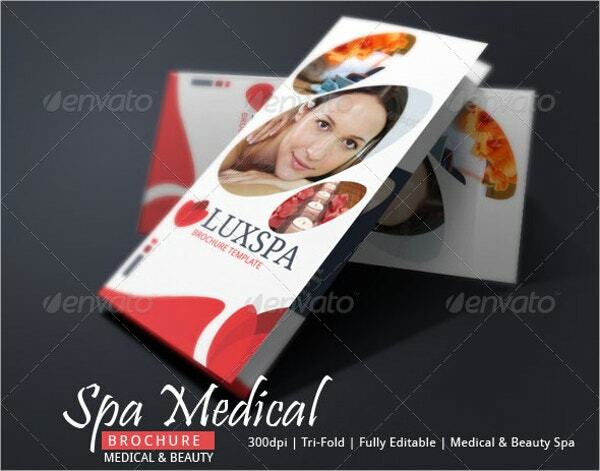 The medical commercial brochure is a complete package for chemists and medical shops. It has a portrait oriented red and white design which is available in 300 DPI printable INDD files. 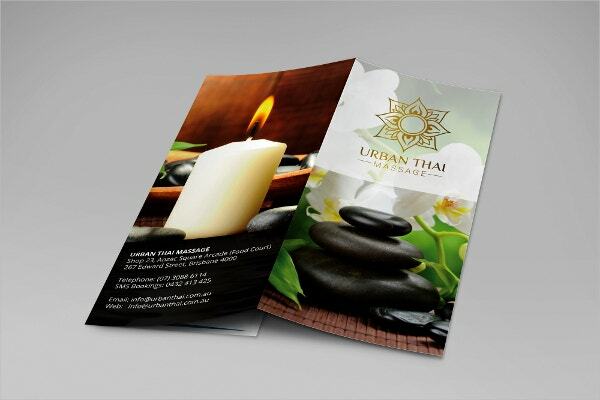 The Thai-centric massage center brochure is quality filled with beautiful graphic art and photo options. 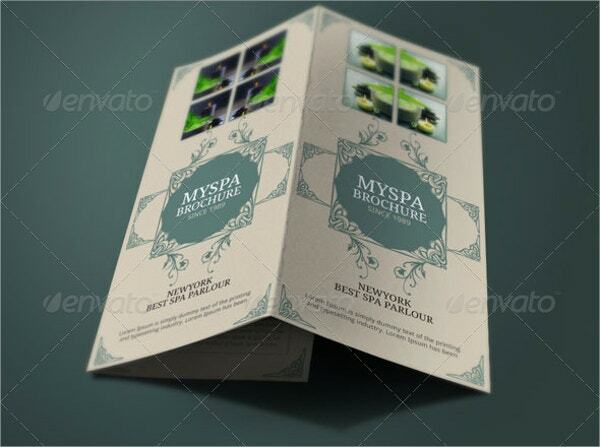 It is trifold with 300 DPI and CMYK color in A4 size. 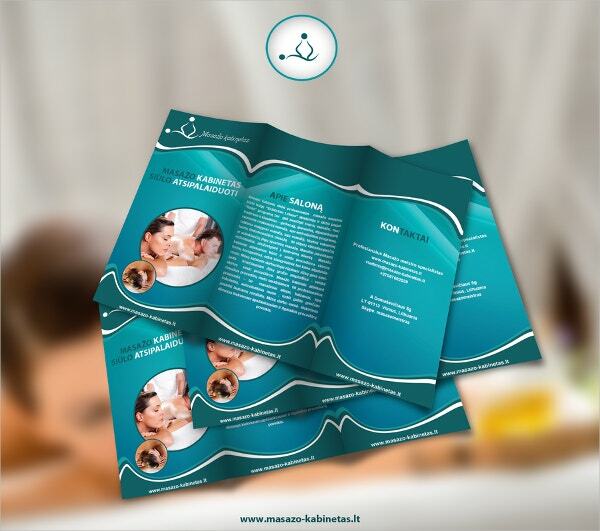 The Pour Bebe brochure exhibits baby-care spas and medical massage centers. 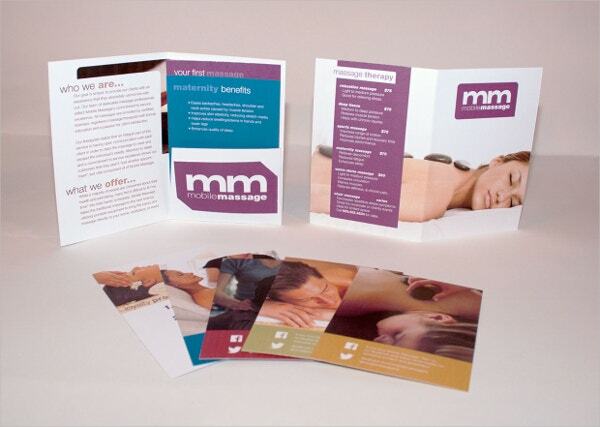 It is available in light purple with white text and baby pictures with a trifold layout. 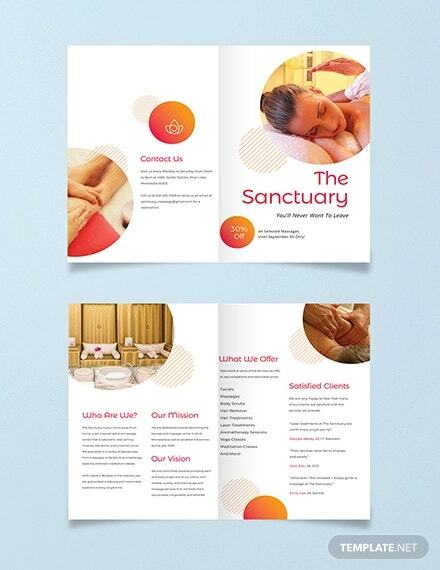 This is a 12-page brochure for treatment spa theme. It displays well organization with generic graphics inside. The brochure is available in INDD files with 300 DPI CMYK format. 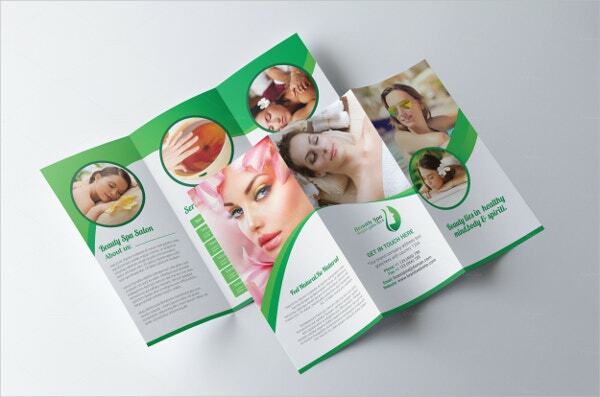 Beauty and Spa go hand in hand just like this beautiful brochure that has a trifold design in green and white. It suits beauty shops and comes in EPS and AI files. 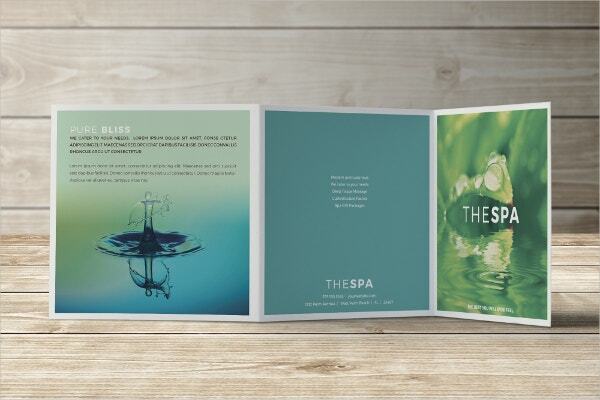 No better promotion is possible than this trifold Spa Brochure. It has a close to nature design with logo and luxury graphics. It’s downloadable in 300 DPI A4 INDD files. 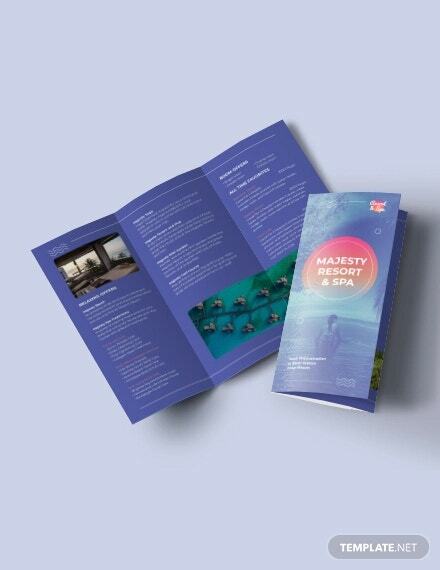 This is a squared brochure that has 14 folded pages with neat graphics on white. 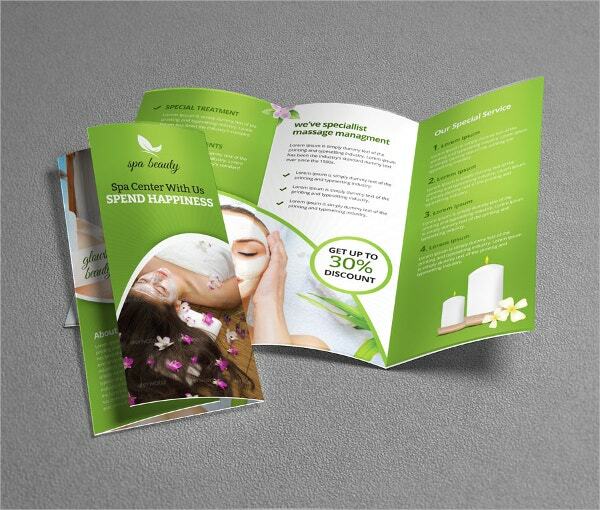 The brochure is efficient and comes in 840×120 mm PSD files with 300 DPI print ready formats. 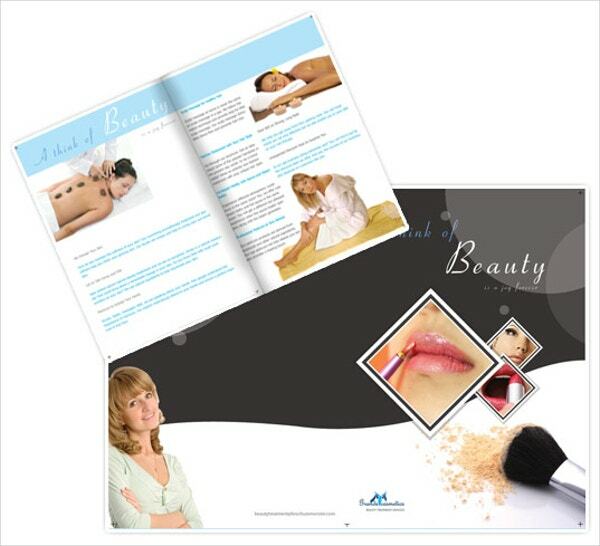 Natural beauty is enhanced at spas just like this luxurious brochure offered in a trifold layout. It has vector graphics with beautiful photos that come in EPS, AI, high-quality files. 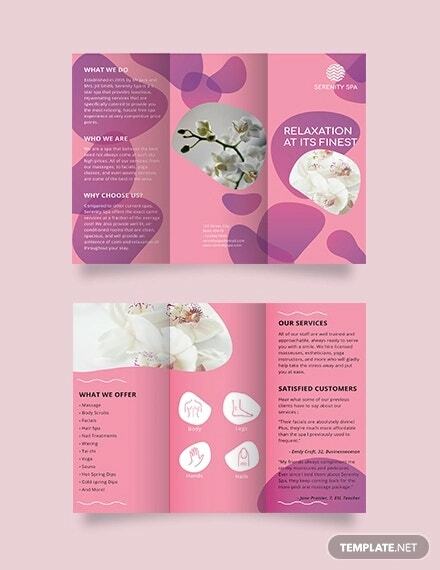 Aptly named as heavenly, this brochure offers soothing fractal artwork on its cover and white space for clear information text. It is available for download from Dribble. 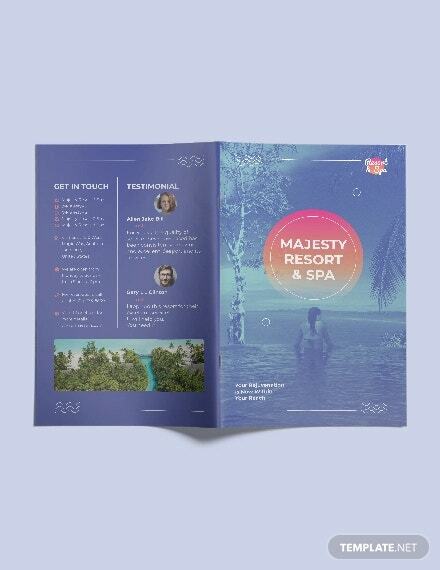 The cool blue trifold brochure offers relaxing graphics and spa photos perfect for promotional purposes. It comes in HD PNG file which can be downloaded instantly. 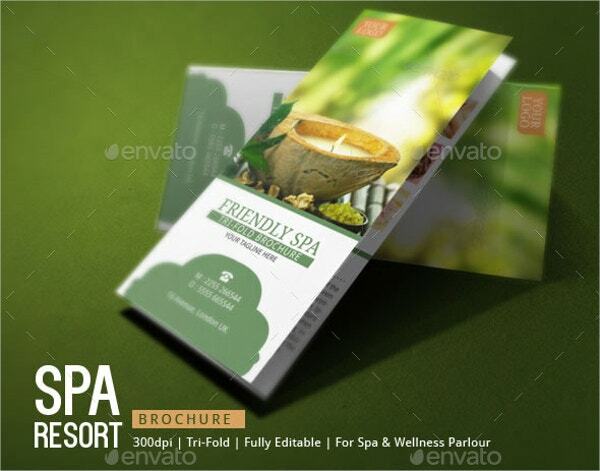 This brochure is loaded with information and focuses entirely on the anatomical aspect of the spa remedies. 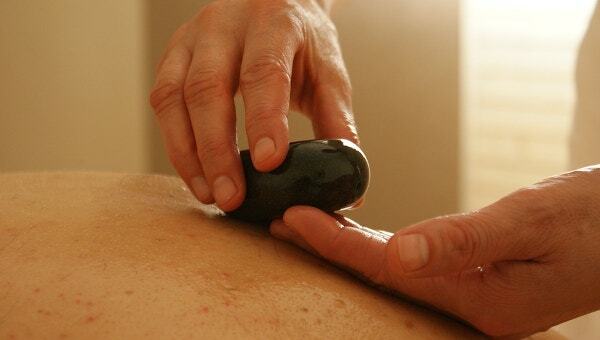 It is suitable for high-profile spa centers and medicine shops. This graphic template features its own logo, bifold brochure, and a t-shirt print. 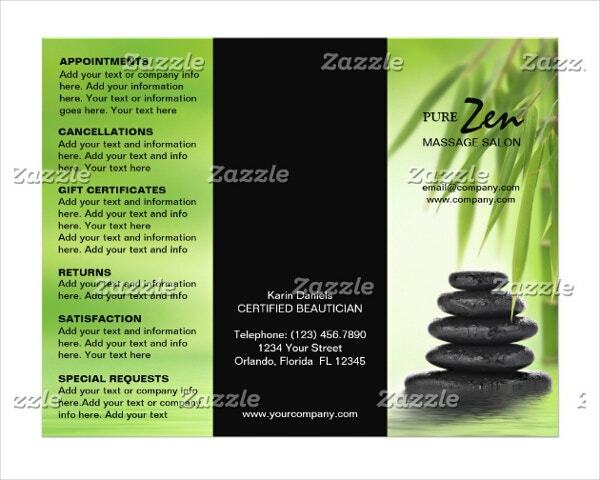 The multifarious design is available in high quality and suits your company profile well with double-sided printing. 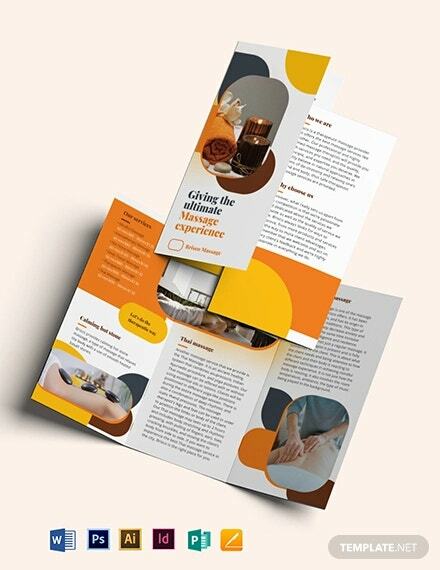 This printable brochure features single page layout with different colors to display different information. 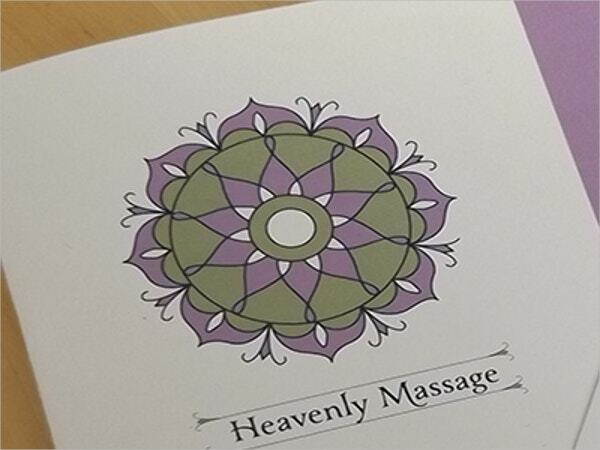 It acts perfectly as a massage service menu and comes in 300 DPI 8.5″ x 11″ page size. 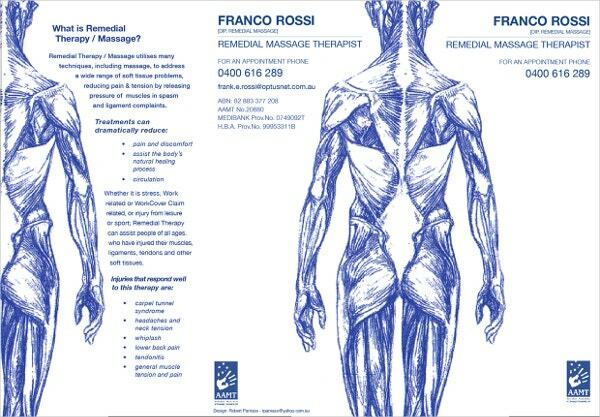 Massage is both a healthy and relaxing activity which requires a decent publicity. You can save the hassle of making the suitable design which will highlight your outlet like no other. 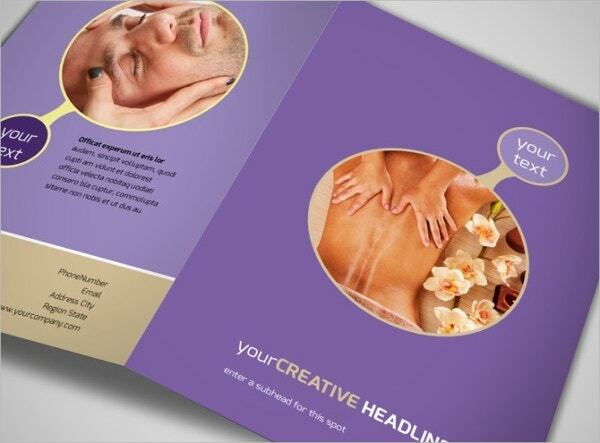 The physical therapy brochures provide all kinds of necessary formats and colors for the purpose. Download and spread the word.